Forty-nine years ago I took a job as a page/clerk at the Public Library of Nashville and Davidson County. I've been involved one way or the other in working for, working with, or observing public libraries for most of the years since. It is with that background that I recently read Wayne A. Wiegand's new book Main Street Public Library (Univ. 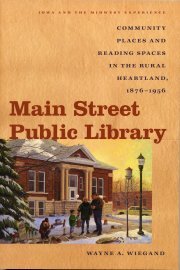 of Iowa Press, 2011) which has the subtitle "Community Places and Reading Spaces in the Rural Heartland, 1876-1956". If you are at all interested in the history and/or the role of the American public library, I recommend that you read this book. If for nothing else, the book is well worth reading for the excellent histories of the four Midwestern public libraries on which the book is based. They are the public libraries in Sauk Centre, MN; Osage, IA; Lexington, MI; and Rhinelander, WI. Wiegand uses the experiences of these libraries to challenge some of the basic rhetoric about the value and purpose of public libraries. The final paragraph in the book sums up his findings: "The purpose and mission of the Main Street public libraries studied here were not primarily to supplement formal education, to pursue a policy of 'not censorship, but selection,' or to provide information considered essential for the marketplace or the politics of democracy. Those were secondary goals, and because the library was an institution that local citizens did not have to patronize, these goals were regularly and necessarily compromised, despite, professional rhetoric. Their actual primary purpose and mission - as crafted over the generations by local leaders and users - was to foster the kinds of social harmony that community spaces and stories, experienced shared, provide." Obviously, the experience of four small Midwestern public libraries is not sufficient to make broad generalizations about the entirety of public libraries in America. However, it is not a revelation to me that the rhetoric of the value and role of the public libraries by the library profession is often mismatched with the reality of actual public library service this country. I'm not willing to acquiesce to the entirety of Wiegand's arguments though. I believe that public libraries can and do change lives in a positive way through reading (and reading alternatives) yes, but also by being an educational institution and a source of reliable information. In my opinion public libraries have moved too far in the direction of being popular materials centers. I advocate a more balanced approach. Public libraries have an opportunity to play a major role in early childhood education. Is it more important to provide the latest popular movies on DVD? A blog post is not an adequate venue for a debate on the role of the public library, however. Thanks Wayne for creating the basis for such a debate. An article by Wiegand in American Libraries about Main Street Public Library. Another review of Main Street Public Library.